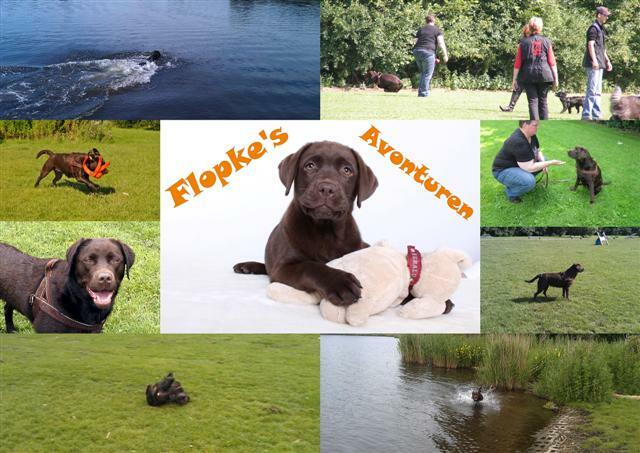 Flopke's Avonturen: Gefeliciteerd Flopke, al 3 jaar! Gefeliciteerd Flopke, al 3 jaar! Nu eerst het oortje en koffie! Fijne dag verder….. Het was heerlijk! It was delicious! Yes, it is already three years ago that on an early sunday morning the Glamour nest was born at our breeder. Oh, how small they were in the first pictures, but they have all grown up to 8 strong and lovely brown labs, who have great resemblance among each other! Also in caracter if I read the other stories on the blog! Check it out to see Floppy’s other brothers and sister! Also the big boss has thought about his little girl turning 3! See pic above. And there is already a snack ready for her to eat while I have my coffee break! I hope the sun will shine this afternoon so we can go out to the parc and play! Last week she already jumped into the water…….brrrr…to cold for me! Now first coffee and a snack! Have a nice day!